Posted by Grace on April 25, 2013; This entry is filed under Natural Grace Therapies. 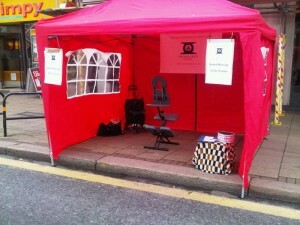 Chair massage is a great way to take massage out of the treatment room into a more public arena. A specially adapted chair is used for the client to sit in to receive their massage. No oil is used and the client remains fully clothed. It can be done in the workplace, shopping centres, exhibitions and even at music festivals. The length of a session is between 10 to 30 minutes long. 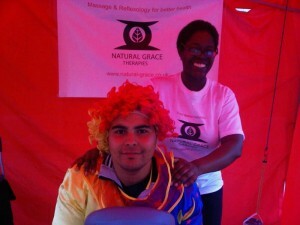 Last year I gave chair massages on a monthly basis at two offices in central London. The treatments were for 30 minutes each and were very much enjoyed and appreciated by the staff. I have also given chair massages at Islington Council at their annual health day for staff. Every year I work at The Mind, Body, and Spirit Show, The Yoga Show and The Back Pain Show in London on the Massage World Magazine stand. I enjoy working at these shows as it is a chance to meet the general public who are interested in their health and well-being. I work at these events with other therapists. 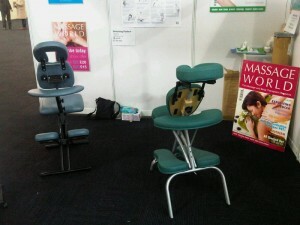 Chair massage is a great way to promote massage at events. In my local area of Thornton Heath there is an annual street festival that takes place in September. I offer 10 and 20 minute massages. Passers by are curious about the chair, wondering how it all works and what I will be doing . One year I gave a clown a chair massage at the festival. When I am doing a treatment people generally stop to watch. I am able to talk about my massage work and how I can help them with their muscular pain issues or help to reduce their stress and tension. Whenever I do chair massage to promote my business I always charge for it. It is usually a nominal fee of £5 for 10 minutes and £10 for 20 minutes. This is to cover the cost of paying for the space which can be anything between £15 to £50. In order to get people’s contact details I give them the chance to win a prize if they sign up for my monthly newsletters. The prize is either some bath and body products or a massage gift voucher. Sending my e-newsletter means I can keep in touch with them on a regular basis and hopefully get them to book a full treatment. The photograph on the left shows me giving a chair massage 2 years ago at Afridiziak Gifts & Occasions Xmas fair. It is not always quiet when giving treatments in these more public areas but clients are able to ignore the noise around them and enjoy their treatment. I have not yet worked at any music festival yet partly because I am not keen on the thought of camping and portaloos!